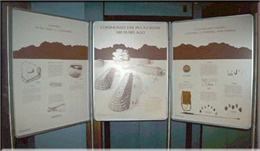 "Life in La Crosse 500 Years Ago"
This three-panel exhibit, "Life in La Crosse 500 Years Ago," explores aspects of community life in a Native American village occupied around A.D. 1400. The remains of seven longhouses, discovered and excavated for the Wisconsin Department of Transportation by the Museum Archaeology Program, provided clues to the complex and fascinating lives of the inhabitants who once lived near present-day La Crosse. Available for standard one month loan periods, though longer loans may be arranged. Assembled exhibit measures approximately 9 feet long by 6 feet high. See contact information below to arrange pick-up/transport.